Windscreen wiper on a parked car. In this common design, the force from the arm is distributed evenly with a series of linkages known as a whippletree. A windscreen wiper or windshield wiper (American English) is a device used to remove rain, snow, ice and debris from a vehicle's front window. Almost all motor vehicles, including cars, trucks, buses, train locomotives, and watercraft with a cabin—and some aircraft—are equipped with one or more such wipers, which are usually a legal requirement. A wiper generally consists of a metal arm; one end pivots, the other end has a long rubber blade attached to it. The arm is powered by a motor, often an electric motor, although pneumatic power is also used for some vehicles. The blade is swung back and forth over the glass, pushing water, other precipitation, or any other impediments to visibility, from its surface. On vehicles made after 1969, the speed is normally adjustable, with several continuous speeds, and often one or more intermittent settings. Most personal automobiles use two synchronized radial-type arms, while many commercial vehicles use one or more pantograph arms. On some vehicles, a windscreen/windshield washer system is also used to improve and expand the function of the wiper(s) to dry or icy conditions. This system sprays water, or an antifreeze window washer fluid, at the windscreen using several well-positioned nozzles. This system helps remove dirt or dust from the windscreen when it is used in concert with the wiper blades. When antifreeze washer fluid is used, it can help the wipers remove snow or ice. For these types of winter conditions, some vehicles have additional heaters aimed at the windows, or embedded heating wire(s) in the glass; these defroster systems help to keep snow and ice from building up on the windscreen. Less frequently, miniature wipers are installed on headlights to ensure that they function optimally. One of the earliest recorded patents for the windscreen wiper is by George J. Capewell of Hartford Connecticut, which was filed on August 6, 1896 . His invention was for an automated , motorised, wiper for "cars, locomotives, and such land-vehicles". Other early designs for the windscreen wiper are credited to Polish concert pianist Józef Hofmann, and Mills Munitions, Birmingham who also claimed to have been the first to patent windscreen wipers in England. At least three inventors patented windscreen cleaning devices at around the same time in 1903; Mary Anderson, Robert Douglass, and John Apjohn. In April 1911, a patent for windscreen wipers was registered by Sloan & Lloyd Barnes, patent agents of Liverpool, England, for Gladstone Adams of Whitley Bay. American inventor Mary Anderson is popularly credited with devising the first operational windscreen wiper in 1903. In Anderson's patent, she called her invention a "window cleaning device" for electric cars and other vehicles. Operated via a lever from inside a vehicle, her version of windscreen wipers closely resembles the windscreen wiper found on many early car models. Anderson had a model of her design manufactured, then filed a patent (US 743,801) on June 18, 1903 that was issued to her by the US Patent Office on November 10, 1903. 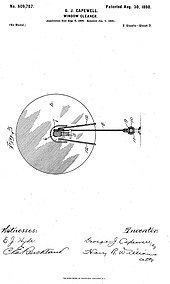 A similar device is recorded 3 months prior to Anderson's patent, with Robert A Douglass filing a patent for a "locomotive-cab-window cleaner" on 12 March 1903. Irish born inventor James Henry Apjohn (1845–1914) patented an "Apparatus for Cleaning Carriage, Motor Car and other Windows" which was stated to use either brushes or wipers and could be either motor driven or hand driven. The brushes or wipers were intended to clean either both up and down or in just one direction on a vertical window. Apjohn's invention had a priority date in the UK of 9 October 1903. John R. Oishei (1886-1968) formed the Tri-Continental Corporation in 1917. This company introduced the first windscreen wiper, Rain Rubber, for the slotted, two-piece windscreens found on many of the automobiles of the time. Today Trico Products is one of the world's largest manufacturers of windscreen wipers. Bosch has the world's biggest windscreen wiper factory in Tienen, Belgium, which produces 350,000 wiper blades every day. The first automatic electric wiper arms were patented in 1917 by Charlotte Bridgwood. Inventor William M. Folberth and his brother, Fred, applied for a patent for an automatic windscreen wiper apparatus in 1919, which was granted in 1922. It was the first automatic mechanism to be developed by an American, but the original invention is attributed by others to Hawaiian, Ormand Wall. Trico later settled a patent dispute with Folberth and purchased Folberth's Cleveland company, the Folberth Auto Specialty Co. The new vacuum-powered system quickly became standard equipment on automobiles, and the vacuum principle was in use until about 1960. In the late 1950s, a feature common on modern vehicles first appeared, operating the wipers automatically for two or three passes when the windscreen washer button was pressed, making it unnecessary to manually turn the wipers on as well. Today, an electronic timer is used, but originally a small vacuum cylinder mechanically linked to a switch provided the delay as the vacuum leaked off. The inventor of intermittent wipers (variable-rate wipers) might have been Raymond Anderson, who, in 1923, proposed an electro-mechanical design. (US Patent 1,588,399). In 1958, Oishei et al. filed a patent application describing not only electro-mechanical, but also thermal and hydraulic designs. (US Patent 2,987,747). Then, in 1961, John Amos, an engineer for the UK automotive engineering company Lucas Industries, filed the first patent application in the UK for a solid-state electronic design. (US patent 3,262,042). In 1963, another form of intermittent wiper was invented by Robert Kearns, an engineering professor at Wayne State University in Detroit, Michigan. Kearns's design was intended to mimic the function of the human eye, which blinks only once every few seconds. In 1963, Kearns built his first intermittent wiper system using off-the-shelf electronic components. In the Kearns design, the interval between wipes was determined by the rate of current flow into a capacitor; when the charge in the capacitor reached a certain voltage, the capacitor was discharged, activating the wiper motor for one cycle. Kearns showed his wiper to the Ford Motor Company and proposed that they manufacture the design. Ford executives rejected Kearns' proposal at the time, but later offered a similar design as an option on the company's Mercury line, beginning with the 1969 models. Kearns sued Ford in a multi-year patent dispute that Kearns eventually won in court, inspiring the 2009 film Flash of Genius. In March 1970, Citroën introduced rain-sensitive intermittent windscreen wipers on their SM model. When the intermittent function was selected, the wiper would make one swipe. If the windscreen was relatively dry, the wiper motor drew high current, which set the control circuit timer to delay the next wipe longest. If the motor drew little current, it indicated that the glass was wet and would set the timer to minimize the delay. Pneumatic motor drive on a railroad locomotive windscreen wiper. The lever on the motor operates a valve to supply pressurized air. Wipers may be powered by a variety of means, although most in use today are powered by an electric motor through a series of mechanical components, typically two 4-bar linkages in series or parallel. Vehicles with air operated brakes sometimes use pneumatic wipers, powered by tapping a small amount of pressurized air from the brake system to a small air operated motor mounted on or just above the windscreen. These wipers are activated by opening a valve which allows pressurized air to enter the motor. Early wipers were often driven by a vacuum motor powered by manifold vacuum. This had the drawback that manifold vacuum varies depending on throttle position, and is almost non-existent under wide-open throttle, when the wipers would slow down or even stop. This problem was overcome somewhat by using a combined fuel/vacuum booster pump. Some cars, mostly from the 1960s and 1970s, had hydraulically driven wipers, most notably the '61-'69 Lincoln Continental. On the earlier Citroën 2CV, the windscreen wipers were powered by a purely mechanical system, a cable connected to the transmission; to reduce cost, this cable also powered the speedometer. The wipers' speed was therefore variable with car speed. When the car was waiting at an intersection, the wipers were not powered, but a handle under the speedometer allowed the driver to power them by hand. Lever mechanism of a windscreen wiper. The motor in the middle converts the circular rotation to an intermittent rotation. The lever arms have different lengths, so the stop position at the reverse point is different. Most wipers are of the pivot (or radial) type: they are attached to a single arm, which in turn is attached to the motor. These are commonly found on many cars, trucks, trains, boats, airplanes, etc. Modern windscreen wipers usually move in parallel (Fig. 1, below). However, various Mercedes-Benz models and other cars such as the Volkswagen Sharan employ wipers configured to move in opposite directions (Fig. 2), which is mechanically more complex but can avoid leaving a large unwiped corner of the windscreen in front of the front-seat passenger. A cost benefit to the auto-maker occurs when wipers configured to move in opposite directions do not need to be repositioned for cars exported to right hand drive countries such as the UK and Japan. Another wiper design (Fig. 6) is pantograph-based, used on many commercial vehicles, especially buses with large windscreens. Pantograph wipers feature two arms for each blade, with the blade assembly itself supported on a horizontal bar connecting the two arms. One of the arms is attached to the motor, while the other is on an idle pivot. The pantograph mechanism, while being more complex, allows the blade to cover more of the windscreen on each wipe. However, it also usually requires the wiper to be "parked" in the middle of the windscreen, where it may partially obstruct the driver's view when not in use. A few models of automobile sometimes employ a pantograph arm on the driver's side and a normal arm for the passenger. Triumph cars, Lexus and several US makes employ this method to cover more glass area where the windscreen is quite wide but also very shallow. The reduced height of the windscreen would need the use of short wiper arms which would not have the reach to the edge of the windscreen. A simple single-blade setup with a center pivot (Fig. 4) is commonly used on rear windscreens, as well as on the front of some cars. Mercedes-Benz pioneered a system (Fig. 5) called the "Monoblade", based on cantilevers, in which a single arm extends outward to reach the top corners of the windscreen, and pulls in at the ends and middle of the stroke, sweeping out a somewhat "M"-shaped path. This way, a single blade is able to cover more of the windscreen, displacing any residual streaks away from the center of the windscreen. Some larger cars in the late '70s and early '80s, especially LH driver American cars, had a pantograph wiper on the driver's side, with a conventional pivot on the passenger side. Asymmetric wiper arrangements are usually configured to clear more windscreen area on the driver's side, and so are mostly mirrored for left and right-hand-drive vehicles (for example, Fig. 1 vs. Fig 10). One exception is found on the second generations of the Renault Clio, Twingo and Scénic as well as BMW's E60 5 Series and E63 6 Series, the Peugeot 206 and the Nissan Almera Tino, where the wipers always sweep towards the left. On right-hand-drive models, a linkage allows the right-hand wiper to move outwards towards the corner of the windscreen and clear more area. Fig. 7: MAN, DAF XF, Toyota FJ Cruiser, Jaguar E-Type, MGB, MG Midget, Austin Healey Sprite (a 1968 US-only ruling required a certain percentage of the windscreen to be wiped). Works similar to Fig. 8 but not a split screen windscreen and rest state is at the bottom of the windscreen facing outwards. 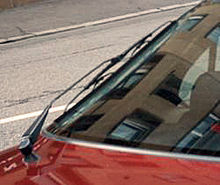 Some vehicles are fitted with wipers (with or without washers) on the back window as well. Rear-window wipers are typically found on hatchbacks, station wagons / estates, sport utility vehicles, minivans, and other vehicles with more vertically-oriented rear windows that tend to accumulate dust. First offered in the 1940s, they achieved widespread popularity in the 1970s after their introduction on the Porsche 911 in 1966 and the Volvo 145 in 1969. In the 1960s, as interest in auto safety grew, engineers began researching various headlamp cleaning systems. In late 1968, Chevrolet introduced high pressure fluid headlamp washers on a variety of their 1969 models. In 1970, Saab Automobile introduced headlight wipers across their product range. These operated on a horizontal reciprocating mechanism, with a single motor. They were later superseded by a radial spindle action wiper mechanism, with individual motors on each headlamp. In 1972, headlamp cleaning systems became mandatory in Sweden. Most windscreen wipers operate together with a windscreen washer; a pump that supplies a mixture of water, alcohol, and detergent (a blend called windscreen washer fluid) from a tank to the windscreen. The fluid is dispensed through small nozzles mounted on the hood. Conventional nozzles are usually used, but some designs use a fluidic oscillator to disperse the fluid more effectively. In warmer climates, water may also work, but it can freeze in colder climates, damaging the pump. Although automobile antifreeze is chemically similar to windscreen wiper fluid, it should not be used because it can damage paint. The earliest documented idea for having a windscreen wiper unit hooked up to a windscreen washer fluid reservoir was in 1931, Richland Auto Parts Co, Mansfield, Ohio. Uruguayan racecar driver and mechanic Héctor Suppici Sedes developed a windscreen washer in the late 1930s. Since 2012, nozzles are replaced on many cars by a system called AquaBlade, developed by the company Valeo. This system supplies the washing liquid directly from the rubber element of the wiper blade. This system suppresses visual disturbances during driving and so reduces the reaction time of the driver in case of incident. Some larger cars are equipped with hidden wipers (or depressed-park wipers). When wipers are switched off in standard non-hidden designs, a "parking" mechanism or circuit moves the wipers to the lower extreme of the wiped area near the bottom of the windscreen, but still in sight. For designs that hide the wipers, the windscreen extends below the rear edge of the hood, and the wipers park themselves below the wiping range at the bottom of the windscreen, but out of sight. Some vehicles are now available with driver-programmable intelligent (automatic) windscreen wipers that detect the presence and amount of rain using a rain sensor. The sensor automatically adjusts the speed and frequency of the blades according to the amount of rain detected. These controls usually have a manual override. Rain-sensing windscreen wipers appeared on various models in the late 20th century, one of the first being the Citroen SM. As of early 2006[update], rain-sensing wipers are optional or standard on all Cadillacs and most Volkswagens, and are available on many other mainstream manufacturers. The rain-sensing wipers system currently employed by most car manufacturers today was originally invented and patented in 1978 by Australian, Raymond J. Noack, see U.S. Patents 4,355,271 and 5,796,106. The original system automatically operated the wipers, lights and windscreen washers. A common alternative design used on ships, called a clear view screen, avoids the use of rubber wiper blades. A round portion of the windscreen has two layers, the outer one of which is spun at high speed to shed water. High speed aircraft may use bleed air which uses compressed air from the turbine engine to remove water, rather than mechanical wipers, to save weight and drag. Effectiveness of this method also depends on water-repellent glass treatments similar to Rain-X. Many jurisdictions have legal requirements that vehicles be equipped with windscreen wipers. Windscreen wipers may be a required safety item in auto safety inspections. Some US states have a "wipers on, lights on" rule for cars. ^ "WINDOW CLEAN". google.com. Retrieved 7 March 2019. ^ a b c "The Windshield Wiper". American Heritage. ^ "Windshield Wipers". Massachusetts Institute of Technology. ^ "Mary Anderson". Encyclopedia of Alabama. ^ "Window-Cleaning Device". United States Patent and Trademark Office. ^ "Locomotive-cab-window cleaner". google.com. Retrieved 5 April 2018. ^ Robert Bosch GmbH (2009-01-16). "BoschLive". Bosch.com.au. Retrieved 2011-09-23. ^ "The Evolution of Wind Shield Wipers - A Patent History - IPWatchdog.com | Patents & Patent Law". IPWatchdog.com | Patents & Patent Law. 2014-11-09. Retrieved 2018-10-09. ^ "Automatic Windshield Wipers - Ohio History Central". www.ohiohistorycentral.org. Retrieved 2018-01-13. ^ Schudel, Matt (26 February 2005). "Accomplished, Frustrated Inventor Dies". Washington Post. Retrieved 12 December 2011. ^ "The Cars of James Bond: Lincoln Continental". wordpress.com. 25 June 2014. Retrieved 5 April 2018. ^ "The Rear Wiper: A Vital Strand of Porsche DNA". wordpress.com. 30 April 2015. Retrieved 5 April 2018. ^ "AAA Digest of Motor Laws: Headlight Use: United States Canada". drivinglaws.aaa.com. American Automobile Association. Retrieved 4 September 2017. ^ Tuoti, Gerry (7 April 2015). "New state law: Wipers on, lights on". Cape Cod Times. Hyannis, Massachusetts. Retrieved 4 September 2017. Wikimedia Commons has media related to Windshield wipers. 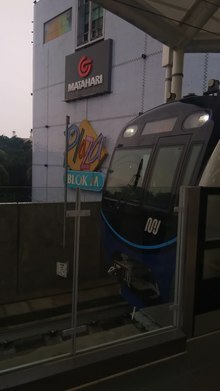 This page was last edited on 18 April 2019, at 02:07 (UTC).